In website builder WebWave CMS element "login" allows users to log in on your website and enter subpages with restricted access. With login element users can also create accounts on your website. In this article, you will learn how to build a website with login element. In order to add a login element to a website created in WebWave web design software, select its icon in a toolbar on the left side of the builder and move it to your website. Login panel states change how the panel looks in different situations, depending if a user is signed in or not. Not logged in - panel's style when a user is not logged on your website. Logged in - panel's style when a user is logged on your website. In "Login settings" in the Settings panel you can set whether users will be able to register on your website. If they won't be, webmasters can create accounts for them. This option is useful when you want to share website content with only particular users (for example, the ones who made a payment). You can change the style of the login element the same way you change the style of any other element in website builder WebWave. Click on it and in Settings panel change its parameters. In order to change the text on the login element, double click on it. 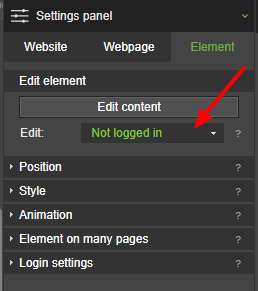 To change the style of a panel when a user is logged in, change element's state in the Settings panel. Keep in mind that this element is only available for webmasters with active Agency Plan.